Jade and I have been on a tofu kick lately; which is probably a good thing as the benefits of tofu have been extolled in varying places in the blogdom lately. So far, we’ve had stir fries with tofu, taho, which is a sweet dessert, and this fish stuffed tofu experiment. 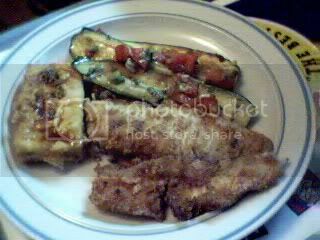 In this photo, the tofu is the rectangular item paired with the parmesan fried tilapia and grilled zucchini dressed with chopped tomatoes and green onions with balsamic vinegar. We had a block of firm tofu that we weren’t sure what to do with, so we decided to stuff and fry it, similar to the dimsum fare stuffed with shrimps. I didn’t have any shrimps, so these were stuffed with more tilapia. Slice the tofu into 1/2 inch slices and slice again halfway through to create a pocket. Fill the pocket with slivers of fish or shrimp if you have it, which have been seasoned with salt, pepper and slices of green onion. Dip the slices in beaten egg, then dredge in flour, and fry until browned. Drizzle with a mixture of soy, balsamic vinegar and chopped green onions. Hi Panda! yep, me too, for the longest time, I didn’t like tofu except for taho and it’s mostly because of the sago that I liked it. I learned to like it though, and now that we know of it’s health benefits, even more so. Thanks for visiting! Hi Rowena! I knew you had to know about sayote, being from Hawaii! I think the US variety has been hybridized to get rid of the thorns. Hi Joe! It really is very good, and we like it’s flexibility. You really can add it to most anything, and it just absorbs whatever flavor you put it in, whether sweet or savory. Thanks for visiting! We are slowly learning to like Tofu and this really sounds good! I have tried it even in a dessert and it did come out good. I love tofu, but can only find it certain health food stores here and it isn’t even the fresh kind. I hate tofu! but you made it sound so delish that I want to try this recipe:) Happy too to discover new blogs. M so glad I joined Lasang Pinoy. Happy eating and blogging!